The Professional Association of Diving Instructors (PADI) is the world's largest recreational diving membership and diver training organization. PADI was founded in 1966 by John Cronin and Ralph Erickson in an effort to bring professionalism and state of the art teaching methodologies to the burgeoning recreational dive market. PADI courses range from entry levels (such as "Scuba Diver" and "Open Water Diver") to "Master Scuba Diver" and a range of instructor certifications. They also offer various technical diving courses, including decompression diving, trimix diving and gas blending through PADI Tec Rec. PADI members, including dive centers, resorts, educational facilities, instructors, and divemasters, teach the majority of the world's recreational divers. PADI operates offices in Australia, Canada, Switzerland, Japan, Sweden, the United Kingdom, and the United States. PADI Offices serve more than 130 000 individual professional members and more than 6 000 dive centers and resorts in more than 180 countries and territories. Translations of PADI materials are available in more than 26 languages. The PADI system is composed of modules with standardized learning objectives divided into theory and practical skills development. Theory is mainly conveyed by way of self-study using books, computer based training using CD-ROM or online learning. All study options are supplemented with video to help the student diver visualize what they have read. Confirmation of the student diver's level of mastery in standardized knowledge review sessions is carried out by a scuba instructor. Practical skills mastery is obtained through confined water training (pools or relatively shallow water) and performance evaluations in open water. Upon completion of each course, a certification is issued to the student. PADI courses are performance based dive programs, and at the introductory level emphasize practical knowledge, safety and motor skills. The foundations of diving physics, physiology and chemistry are built during entry level programs. The more esoteric details of these concepts are left for later courses when the diver has gained practical knowledge and experience beyond the entry level. These practices fall within current modern learning philosophies and receive regular updates via peer review. 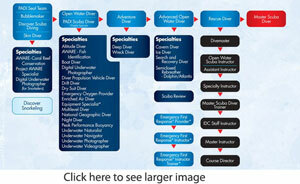 PADI is a member of the World Recreational Scuba Training Council.